Do you use tracking codes on your website? 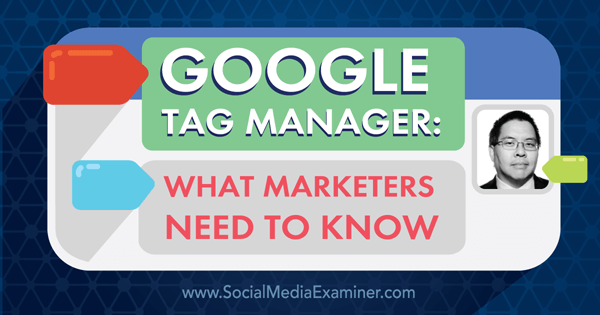 Have you heard of Google Tag Manager? To discover what Google Tag Manager is and how to use it, I interview Christopher Penn. In this episode I interview Christopher Penn, the VP of Marketing Technology at Shift Communications. His book is titled Marketing Blue Belt and he’s also a Google Analytics expert. His brand-new course is the 2016 Marketing Plan Framework: How to Build a Data-Driven Customer Journey. Chris is also co-host of the Marketing Over Coffee podcast. Christopher will explore Google Tag Manager and the future of analytics. You’ll discover how to set up and use Google Tag Manager. 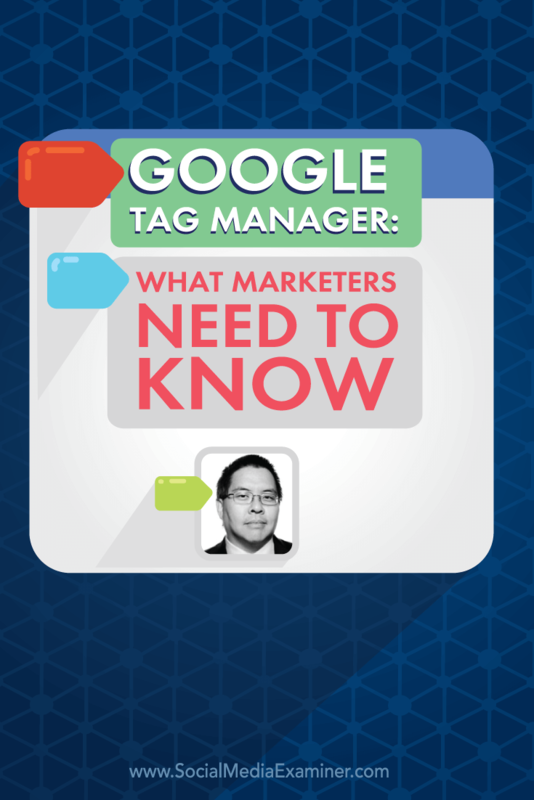 Listen as Chris Penn shares what marketers need to know about Google Tag Manager. Christopher says Tag Manager is a digital bucket that makes it easier to manage website tags such as a Facebook or Twitter remarketing tag, a pixel from an ad tracking system or a piece of java script. He explains that when a website has a lot of pages, or if you use a marketing automation system, such as as Marketo or Pardot to manage multiple websites, things can easily get lost. He says you put the code for Tag Manager on every page of your site only one time then, instead of modifying the tags of individual pages, you simply put new tags in and out of the bucket. Chris adds that it’s a lot more reliable than manually managing tags for each page. Listen to the show to discover how Tag Manager can speed up your site. In addition to speed, Chris believes reliability is a big reason to use Tag Manager. If you have a lot of different webpages, websites or use marketing automation services that have their own landing pages, forgetting to put tags on all those pages will ruin your analytics, Christopher says. As long as you use the bucket on every page, you’re covered. Throw all your tags in to the Google Tag Manger bucket. Image: Shutterstock. The flexibility of Google Tag Manager, is really important. It allows you specify that you want some tags on some pages, other tags on all pages and certain conditions to be met for still others. Chris shares an example. Say you are promoting an event, like Social Media Marketing World, and you want to put a tag on the event page for people who have visited the page, but haven’t yet purchased a ticket. If you’ve haphazardly put tags everywhere, you could lose track of what page your tag needs to be on. With Tag Manager, you can specify it to fire the tag if the url has “smmw16” in it. Tag Manager is also important for social media marketers who don’t have control over website updates. If you’re with a big company and constantly have to go through the IT department to add new tags or if you have a small website and use an outside consultant for website maintenance, it becomes difficult to update tags in a timely manner. With the bucket on every page, you can add and subtract tags through Tag Manager and no one needs to update the website. 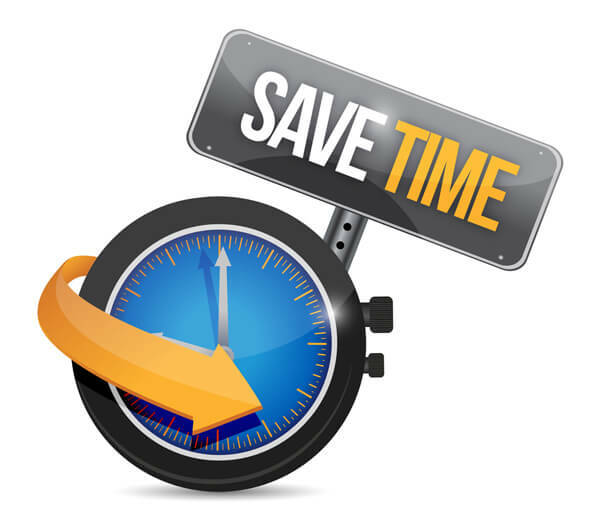 Google Tag Manager will save you time. Image: Shutterstock. Chris illustrates another benefit of using Tag Manager by sharing the example of someone hard coding a Google Analytics tag into their WordPress theme. When the theme is updated, their analytics tags go away. Use Tag Manager with Google Tag Manager for WordPress plugin, and WordPress will automatically put the bucket on every page so you can update the theme as much as you want without losing those tags. Listen to the show to learn about assigning roles within Tag Manager. Chris says if you already have a Google Analytics account, you can go to TagManager.Google.com to sign up for a free account. 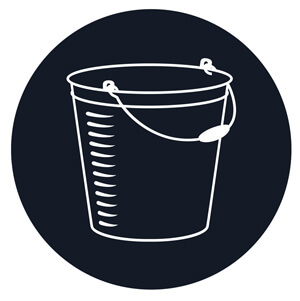 After you set up your website inside of Tag Manager, you’ll get the code for the bucket, which is code that looks a lot like Google Analytics code. Then you add the bucket code to your website pages. If you use a CMS (Content Management System), such as WordPress, Drupal, Joomla, HubSpot or Ektron, put the bucket code in the header of your website. If you’re using WordPress with the Google Tag Manager for WordPress plugin, it will ask for your Google Tag Manager account number. If you aren’t using a Content Management System, simply copy and paste the code onto every page on your site. Google Tag Manager’s snippet is similar to the snippet for Google Analytics. Next, you start putting tags in your empty bucket. Tag Manager comes with a lot of tags built in, for example all the Google properties such as Google Analytics, Google AdWords and Google Consumer Surveys. It also supports a number of third-party services like LinkedIn, VisualDNA, Neustar and CrazyEgg. There’s even a Custom HTML Tag for your Facebook code, Twitter code, Google+ code or any other services. Simply add your custom HTML and name the tag. As you set up new tags inside Tag Manager, you’ll decide whether to run each tag on all, some or single pages. He says there’s also a referrer detection you can use to fire certain tags only if a website visitor is coming from Facebook or Twitter! Once you’ve added your first set of tags to your bucket, hit Save. Then click Publish, to push the tag live on your website. 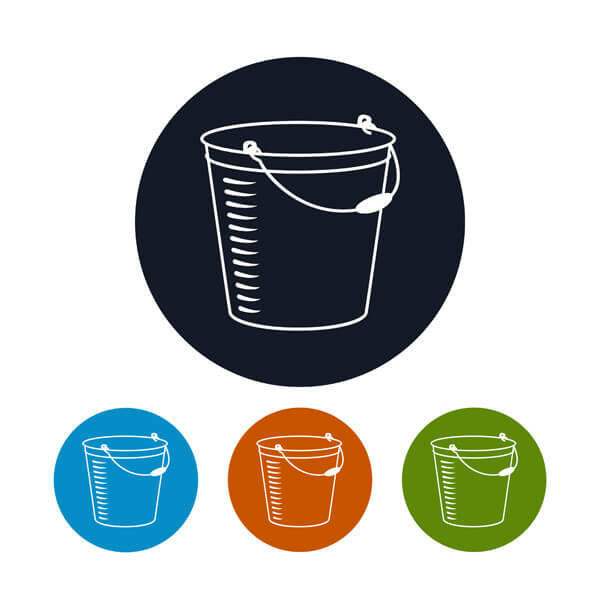 Chris shares that even though you have one master bucket, you can have different folders inside the bucket to keep it organized. For example, put all of your social media tags in one folder and all your remarketing tags in another folder. Divvy your tags in to separate sub-buckets within Google Tab Manager. Image: Shutterstock. Christopher explains how to use a Google Chrome extension called Google Tag Assistant along with Google Analytics to verify the tags in your bucket are working correctly and remove all your old tags. Listen to the show to discover how to run tags only on specific pages. Tag Manager is used for infrastructure, Christopher explains, and you can use a lot of its features to pass special data to Google Analytics. For example, you can use Tag Manager to tell you when someone is hovering over a video on your website, even if they don’t click on it. Google Tag Manager will track Events for Google Analytics. Google Analytics counts this event as a conversion if you set up a goal or an audience for that. 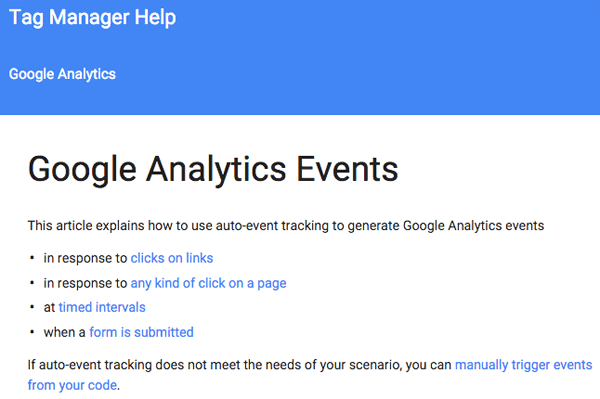 Chris shares that you can find information on event tracking inside the Google Analytics Help Catalog. You can then use that to remarket to those who watched the video and offer them a special discount. Listen to the show to hear more about the magic that happens between Google Tag Manager and Google Analytics. Christopher says he sells his books on Amazon, but has zero control over Amazon. He’s set up an outbound click tracker to track any click on a link that goes from his site to Amazon as a goal. He then compares the number of books he’s sold with the number of clicks there were to Amazon to figure out how much a click is worth when compared to a book sale. Basically, as long as Tag Manager is running, it can track anything that has HTML on your website. To learn more about Tag Manager, Christopher suggests taking the Google Tag Manager Fundamentals course, which is part of Google’s Analytics Academy. Once you get up-to-speed and are ready for advanced installations, read Simo Ahava’s blog. Listen to the show to discover how YouTube click tracking is more advanced than in other video players. Of immediate interest to people who work with social media analytics are IBM’s Watson Analytics which let you upload any numerical data and do advanced statistics (without having to know statistics), and Watson Social Media Analytics, which uses social media data to identify key things you should pay attention to in your analytics. What’s cool is that is uses AI (Artificial Intelligence) to contextually remove information that is irrelevant. Chris shares that Watson Social Media Analytics will be free until March 31, 2016. Watson Analytics is available for free with a small amount of data and offers a professional version for $30 a month. Christopher explains how analytics has evolved and says that, in the beginning, analytics was just data, a bunch of stuff. Then came diagnostic data to show you what happened and tools like Google Analytics to help people use the data (or stuff) to understand what happened. We’re now using prescriptive analytics. This is where tools can report what happened and then make suggestions of what to do based on that data. Chris says we’re headed toward predictive analytics which will use data to tell you what’s going to happen next. After that, Chris believes, will be proactive analytics. At this point, he says the tools will have enough data and insight to do stuff for us. Listen to the show to learn more about Christopher Penn’s 2016 Marketing Plan Framework. Listomatic is a free iOS mobile app that helps you create and manage Twitter lists on the go. 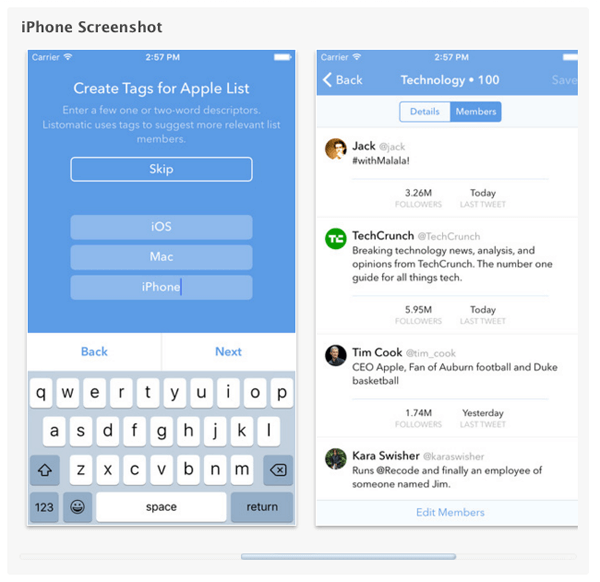 Listomatic helps you create and manage Twitter lists from your iOS device. The app uses a system of tags you define to suggest people for lists you already have, and makes it very easy to access your lists. It’s quicker, easier, and much more organized than managing lists inside Twitter. The best thing about Twitter lists is that you can use them to organize your Twitter feed into groups accounts that have things in common. For example, if you follow a bunch of people in technology or social media, put them all on one list. 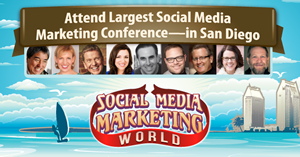 At Social Media Examiner, we keep a Twitter list of all the speakers for every event we do. You can even create a private Twitter list of potential clients or competitors you want to track. Listomatic is a free app. Listen to the show to learn more and let us know how Listomatic works for you. The event takes place in San Diego, California on April 17, 18 and 19, 2016, and the networking is going to be off the hook. Plus, we have our opening-night party on an aircraft carrier, the USS Midway. At the conference Joel Comm will be presenting on the next generation of live, online video streaming software and tools that will help you take your podcasting and online engagement to the next level. There are so many opportunities opening up with live video such as Periscope, Blab and Facebook Live, so Joel and a number of other experts in this field will be telling you everything you need to know about this technology. If you are looking for an economical and authentic way to connect with people, then you want to come to Social Media Marketing World, and experience what it’s all about. Explore the 2016 Marketing Plan Framework: How to Build a Data-Driven Customer Journey. Listen to the Marketing Over Coffee podcast. Install the Google Tag Manager for WordPress plugin. Check out Content Management Systems: WordPress, Drupal, Joomla, HubSpot and Ektron. Explore tags supported in Tag Manager. Install the Google Tag Assistant Chrome extension. Learn more about referrer detection, event tracking and the Google Analytics Help Catalog. Take the Tag Manager Fundamentals course from Analytics Academy. Read about advanced tag installations on Simo Ahava’s blog. Sign up for Watson Analytics and Watson Social Media Analytics. What do you think? What are your thoughts on the future of blogging? Please leave your comments below. Handshake photo Save time photo from Shutterstock. Chris Penn talks with Michael Stelzner about how to use Google Tag Manager in your marketing.